Portable storage is in big demand. It adds appeal for consumers in a culture where people are busier than before. This rise in demand has created an impact on the self-storage industry. The self-storage industry is a $22 billion industry with over 48,000 operators in the USA. One in ten households in the United States rents a storage unit to store extra belongings. 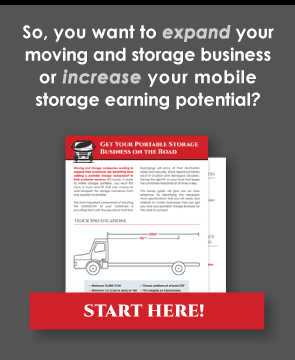 The mobile portable storage business offers advantages to boost revenue as competition increases. Shifting to starting a portable storage unit business can be a profitable decision. Getting started is a daunting task – especially for small or medium business owners. Those starting from scratch may feel even more daunted. Mobile storage serves a much larger market. Its limitations are only how far your business can support delivery and pickup. As long as pickup and delivery distances are practical, your business is in good shape. Moving mobile storage containers can become scaled across markets. Small storage businesses can start with one truck outfitted for all container types. As the business grows, the owner can add more trucks to the fleet to grow revenue. Adding drivers and containers is another important consideration. Starting a mobile storage business can vary in cost based on container types. Portable storage containers are available for ownership or lease. The container type you choose impacts transportation costs and storage of your vehicle. Having the right type of truck and lift system is very important! Your operation needs to meet the needs of your customers, while staying efficient. Until now, the costs of getting the right truck and lift system have been a barrier. No longer are these costs a barrier to entry for mobile storage business owners. Storage container costs are important to consider when starting a storage business. According to CostOwl, smaller storage containers – such as a 20’ deep container – cost $1,000 to $4,000. Larger containers can cost anywhere from $3,000 to $7,000. If money is tight you can save costs by leasing storage containers rather than buying. Lease rates can be anywhere from $200 to $600 per month. Also, it is important to keep in mind any shipping costs vendors might charge. Remember to stay local when purchasing storage containers for your business! Our portable storage delivery system can adapt to every mobile container size. Our horizontal lift makes mobile storage efficient. Enjoy ease of use and give a much better experience for the consumer. This patented storage lift system allows the freedom to operate a at low costs. Run your portable storage business without additional fees or franchise requirements. Our no-tilt hydraulic lift keeps items from shifting inside the container during transport. This reduces the possibility of damage. Your customers can feel more confident their belongings are being handled with care.